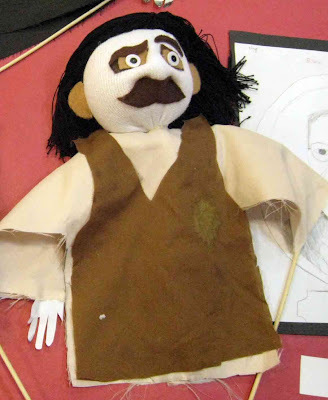 In March, a third generation puppeteer from Portland, OR named Bruce Chesse visited our school district and taught several day-long puppet making workshops. 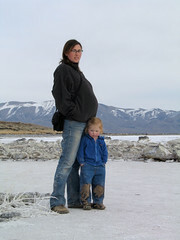 His trip was made possible by SUU's ArtsFusion program, with support from the Utah Arts Council and artworks for kids! The workshop was wonderful and we learned to make some really fun stick or rod puppets using yarn, stuffing, socks, staples, buttons and fabric. About 8 teachers from my school attended the workshop and they just loved it. All of them went away wanting to make puppets in their classes. I ended up helping 12 classes make puppets. That's all of the first, second and fifth grades. It was a lot of fun, and a lot of work. It took three or four class periods to make them, so it kept us busy for a long time. 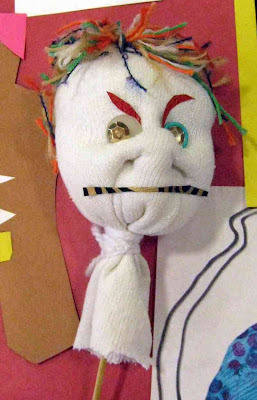 The best part is that most of the teachers used the puppets in their classes when we finished. Some teachers had their kids write scripts, some had them act out fairy tales, and some did great readers' theater with them. These are just a few of the over 300 puppets that the kids made at Iron Springs. The one that is unfinished belongs to a 2nd grader, the dark haired puppet is a 5th grade student's and the large group is from a 1st grade class. Oh these are just wounderful. Much more expresive then I thought they would be. Wounderful! I am so sad that we didn't do these at the reunion. tragic sigh. As soon as I know what Ben's schedule is going to be next summer, we are planning a trip so you can show me how to make them.